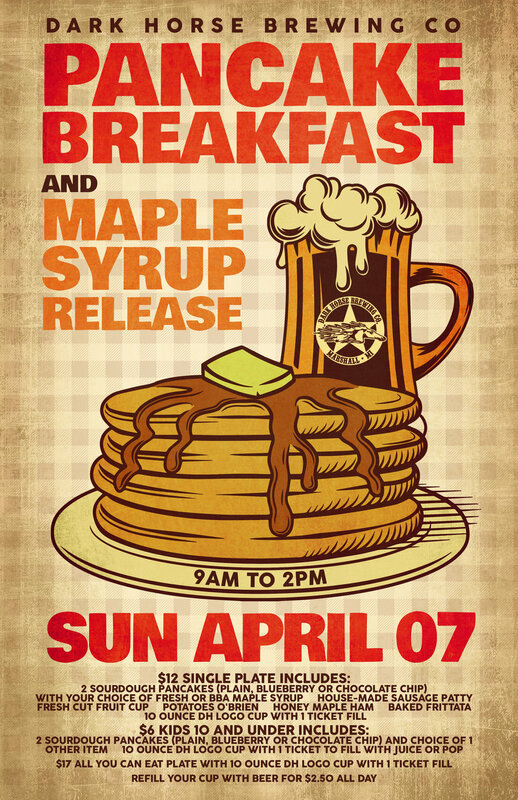 Annual Pancake Breakfast and Maple Syrup Release - Sunday, April 7th from 9am to 2pm — Dark Horse Brewing Co.
Join us for our Annual Pancake Breakfast and Maple Syrup Release on Sunday, April 7th from 9am to 2pm. All the above includes a 10 ounce reusable DH cup plus ticket to fill. Fill your cup using your drink ticket with a Beer, Beermosa, Bloody Beer, Coffee, Juice or Pop. Refill your DH cup for $2.50 ALL DAY!!!! Bottles of BBA or Regular Maple Syrup will be available for purchase in the General Store or Dark Horse Commons.